Compared with shake flask, bioreactor offers a relatively stable and controllable extracellular environment for cell growth and metabolism. Meanwhile, parallel micro-bioreactor system could well meet the screening flux requirement in the process of high-throughput strain screening. In this study, a self-developed 8-parallel micro-bioreactor system with non-invasive optical biosensors was introduced to substitute the traditional shake flask. Optical pH and DO biosensors could be well applied for the process monitoring and controlling in the cultures of commonly used microorganisms through maintaining constant temperature and bioreactor shading treatment. Subsequently, 8-parallel micro-bioreactor system was adopted in the rescreening procedure of high-throughput screening process, and it significantly increased the feasibility of scaling up a cultivating system without any sacrifice on the screening flux. As a result, a designated mutant strain Lactobacillus paracasei S4 was obtained, which presented an improvement of 18.9% on titer value of l-lactic acid. Moreover, the yield also increased from 0.903 ± 0.005 to 0.932 ± 0.013 g/g. In this study, the micro-bioreactor system proved to be applicable and effective in the rescreening procedure of high-throughput screening process. The adopted approach provided a robust tool for screening the strain with high l-lactic acid producing performance. Bioreactor, as a cultivator for microorganisms, can promote the efficiency of biochemical reactions with the advantages of offering a relatively stable and controllable extracellular environment. With the developments on manufacturing and information integrating technologies, industrial bioreactors present new trends towards large scale and informatization. Miniaturized, automated, and high-throughput bioreactors have been widely adopted for strain screening and bioprocess development (Chen et al. 2009; Rao 2007; Schäpper et al. 2009; Thomas et al. 2014). As compared to a bioreactor commonly used in the laboratory, micro-bioreactor has smaller volume and structure, which generally includes micro-bioreactor with milliliter scale (Doig et al. 2005) and ultramicro-bioreactor with microliter or nanoliter scale (El-Ali et al. 2006). Nowadays, micro-bioreactors have been extensively applied in the bioprocess development and in the strain improvement to save labor and material cost through miniaturizing the cultivation process (Betts and Baganz 2006). Traditionally, shake flask and microtiter plate (MTP) were adopted for high-throughput strain screening (Shi et al. 2015; Tan et al. 2014; Zhu et al. 2017). However, these facilities can only support simple input–output relationship, and more importantly, difficulties are normally encountered to obtain valuable process data. Particularly for pH and dissolved oxygen (DO), which play important roles in reflecting the cell physiological status and quality, the traditional probes working on the electrochemical principle have the problems of relatively large volume, high cost, and high contamination risk. Thus, achieving an on-line monitoring and controlling the pH and DO in a micro-bioreactor became a pivotal issue. Correspondingly, in the last three decades, many devoted studies have focused on the development of optical sensors for the determination of pH and DO (Harms et al. 2002; Zhang et al. 2005). However, it could be noted that due to the complex environment existing in the cell culture process, the detection of fluorescent intensity was always limited by various environmental factors, including lighting in the surrounding, the temperature of culture, and the heterogeneity of medium. Therefore, unlike shake flask and MTP, with the integration of optical biosensors as well as exhaust gas mass spectrum, micro-bioreactor could realize the whole-process dynamic analyses of cell growth and metabolism, which would be helpful to quickly understand the physiological characteristics of the mutants in high-throughput screening process. In this study, optical pH and DO detection systems were optimized and were equipped subsequently on the self-developed 8-parallel micro-bioreactor for testing different microbial cultures. Finally, the micro-bioreactor system was introduced into high-throughput rescreening process to substitute the original shake flask for the screening of strain in the higher production of l-lactic acid. Three microorganisms, Escherichia coli DH5α (Takara, China), Pichia pastoris GS115 (Ye et al. 2017), and Lactobacillus paracasei NCBIO01 (Tian et al. 2016), were used in this study. For high-throughput strain screening experiments, the parent strain of L. paracasei NCBIO01 was adopted. Luria–Bertani (LB) medium was used for E. coli culture, which consisted of tryptone 10 g/l, yeast extract 5 g/l, NaCl 5 g/l. The medium for P. pastoris culture was composed of glucose 20 g/l, K2SO4 18.2 g/l, CaSO4 0.93 g/l, MgSO4·7H2O 14.9 g/l, KOH 4.13 g/l, H3PO4 26.8 ml/l, PTM1 12 ml/l, antifoam 1 ml/l. The medium components of L. paracasei culture contained: glucose 130 g/l, peptone 13.3 g/l, yeast extract 13.3 g/l, CH3COONa 0.67 g/l, MnSO4 0.0133 g/l, MgSO4 0.0133 g/l, FeSO4 0.0133 g/l, NaCl 0.0133 g/l, Tween-80 1 ml/l. 20 g/l agar, and 10 g/l CaCO3 were added in solid plate medium for L. paracasei culture. 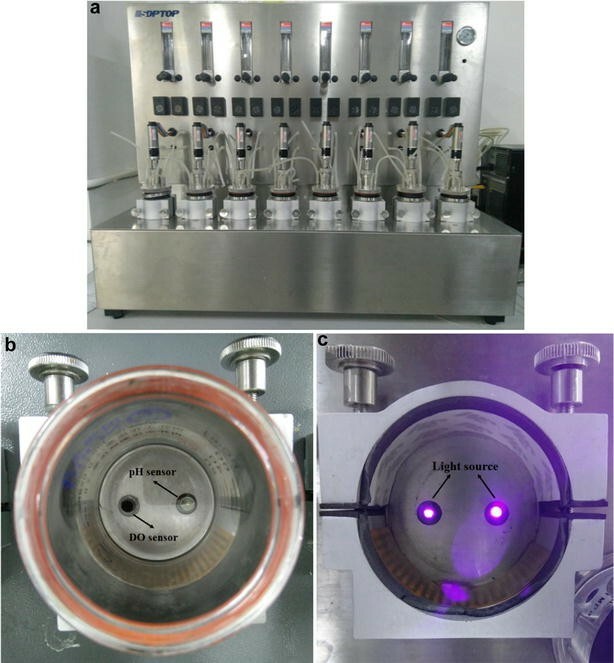 Self-developed 8-parallel micro-bioreactor (volume of 80 ml) system (Guoqiang Bioengineering Equipment Co., Ltd., China) with optical pH and DO sensors was used in this study (Fig. 1). pH biosensor was kindly provided by Prof. Zhu (East China University of Science and Technology, China). Chemosensors were introduced into polymeric backbones via covalent bond as described by Shen et al. (2011) with an excitation wavelength of 405 nm and an emission wavelength of 520 nm. DO biosensor, which was conducted under an excitation wavelength of 405 nm and an emission wavelength of 655 nm, was commercially obtained (Oxygen Sensor Spot SP-PSt3-NAU-YOP, PreSens, Germany). The pH and DO sensors were equipped at the bottom of the micro-bioreactor, and the light was emitted from the bottom of the micro-bioreactor system (Fig. 1b, c). Two-point calibration strategy with standard buffers for pH, as well as nitrogen and saturated air for DO was adopted. For E. coli culture, the agitation rate was increased to 200 and 500 rpm at the time point of 1.5 and 2.4 h, respectively, and aeration was increased to 1 vvm at the time point of 2 h. For P. pastoris and L. paracasei cultures, the pH of broth was controlled at 5.5 and 6.0, respectively, with 25% (w/w) NH4OH solution. Moreover, to analyze the components of exhaust gas from L. paracasei culture, an on-line process mass spectrum (Extrel, USA) was introduced. Subsequently, the physiological parameters such as oxygen uptake rate (OUR) and carbon dioxide evolution rate (CER) could be calculated on-line as described by Liu et al. (2017). The effects of temperature and external light on the optical detection of pH and DO were conducted at different temperatures from 28 to 37 °C and by covering the micro-bioreactor using a foil, respectively. The high-throughput screening of strain for high l-lactic acid production was conducted by following the procedure of Lv et al. (2016) with some minor modifications, where the micro-bioreactor system was adopted in parallel with shake flask in the rescreening process (Fig. 2). Firstly, 10 μl cell suspension of 107–108 cells/ml was treated by atmospheric and room temperature plasma (ARTP) for 50 s with the lethality of approximately 90%. Following this, the suspension was diluted appropriately and 100 μl each of diluted suspension was inoculated into 24-well MTPs and cultured for 24 h with 60 mg/l of bromocresol green as a preliminary screening director. Then, the holes of mixture presenting good performances on the production of organic acid were further spread on the solid plates with bromocresol green and the colonies forming larger yellow halos were selected. Finally, in the rescreening process, 8-parallel micro-bioreactor system and shake flasks were applied for the cultures of the candidate mutants. To verify the fermentation performances of the candidates, l-lactic acid fermentation was carried out in a 5-l stirred bioreactor with a working volume of 4 l, 15% (v/v) inoculum, 37 °C, 150 rpm, and 0.1 vvm. The pH value was automatically controlled at 6.0 by using 25% (w/w) NH4OH solution. All the experiments were performed in triplicate. All the data presented in tables and figures were the averages with standard deviations in triple experiments. Statistical analysis was performed using One-way Analysis of Variance (ANOVA) and t test (P < 0.05) was used to test whether there is any significant difference among treatments (SPSS 22.0, SPSS Inc., USA). A spectrophotometer was used at 600 nm to measure cell growth of E. coli, P. pastoris, and L. paracasei. The cell biomass was expressed as dry cell weight (DCW), which has a linearity with optical density (OD). One OD unit corresponds to 0.34 and 0.41 g/l DCW for P. pastoris and L. paracasei. The pH indicator (bromocresol green) assay in 24-well MTPs was a qualitative method for organic acid concentration in preliminary screening process as described by Lv et al. (2016). The 24-well MTPs fermentation broth was centrifuged at 4000g for 10 min, and then 200 μl supernatant was transferred into a 96-well microplate (Corning, USA). The absorbance change was detected at 616 nm by Multiskan GO microplate reader (Thermo Fisher Scientific). The concentration of l-lactic acid was specifically detected by SBA-40E biosensor analyzer (Shandong Province Academy of Sciences, China). The glucose kit (Kexin Biotechnology Institute, China) was used for residual glucose concentration analysis. where x were values detected by optical pH and DO sensors, while x′ were values detected by off-line pH meter and polarographic DO probe. The volume limitation of a traditional electrochemical probe makes it difficult to be equipped within a micro-bioreactor, whereas the non-invasive optical pH and DO sensors which are made from fluorescent dye film can combine with dissolved H+ and oxygen, respectively, to change the molecular conformation. Thus, the fluorescence signals can be detected under the excitation wavelength and the signal intensities exhibit a positive relationship with the concentrations of H+ and oxygen. It is reasonable to consider that the environmental temperature and lighting would have significant effects on the fluorescent intensities. As shown in Fig. 3a, once the environmental temperature was kept constant, the fluctuations of pH and DO measurements decreased from 0.15 unit and 10% to 0.01 unit and 2%, respectively. Both these values were acceptable for the culture involved with common microorganisms. Simultaneously, under different temperatures (32, 37, and 42 °C), both pH and DO measurements showed good performances (Fig. 3a). Thus, the calibrations of pH and DO should be conducted under the corresponding fermentation temperature to eliminate the temperature effect in the following experiments. On the other hand, a significant fluctuation could also be noted on the pH and DO fluorescent signals when the detection system was exposed to external light (Fig. 3b). It could be observed that the maximum deviation in the measurement of pH reached 0.3 unit in the presence of external light, while it decreased to 0.05 unit with bioreactor shading treatment. Similar for DO measurement, its maximum deviation reduced from more than 15% to about 2%. The relative standard deviations of pH and DO measurements decreased from 1.54 and 6.01% to 0.189 and 0.691%, respectively, which demonstrated the improvements in the accuracy and stability of pH and DO detection. The broth culture is a mixed solution of water, oxygen, organic materials, inorganic ions etc. Environmental temperature will affect the ionization degree of the electrolytes as well as the solubility of oxygen, and thus will subsequently influence the concentrations of H+ and dissolved oxygen. Although many investigations have reported on the novel biosensors for pH and DO detection in terms of principle, material, and chromophore structure (Bambot et al. 1994; Shen et al. 2011), but their practical applications in the process of cell culture were seldom taken into consideration. Hot model experiments of the micro-bioreactors were conducted using three commonly used laboratory microbes (E. coli, P. pastoris, and L. paracasei) as the testing strains. Relatively a higher oxygen supply was required for E. coli and P. pastoris, while L. paracasei exhibited facultative anaerobic characteristics. Moreover, the pH required for an optimal growth and metabolism of the common microbes were in the range of 5.0–8.0. Thus, as compared to shake flask, micro-bioreactor presented significant advantages both in monitoring and controlling the pH and DO. Escherichia coli, as a rapid growth microorganism, possesses a doubling time of approximately 20 to 30 min, and thereby the process pH and DO evolutions were monitored by non-invasive optical biosensors. Otherwise, the responses of DO biosensor to the environmental agitation and aeration were also tested (Fig. 4a). It was found that after about 1 h of lag phase, DO in the broth decreased quickly along with the rapid cell growth. When the agitation rate increased at the time point of 1.5 and 2.4 h, respectively, as well as the aeration increased at the time point of 2 h, the DO value exhibited quick responses of significant raise. These results indicated that non-invasive optical DO detecting systems could well monitor the evolution of DO in an aerobic microbial culture, and subsequently it could be potentially adopted as a process control parameter for process regulation. On the other hand, due to a minor change in the pH value, the broth pH was not controlled during the whole process. Through the comparison of on-line pH by an optical biosensor and the off-line pH by a pH meter, the former was always approximately 0.1 unit lower than the latter (Fig. 4b), which could be partly ascribed to the discrepancy between the buffer of normalized pH and real broth. Simultaneously, his deviation could be considered as a system error, and the non-invasive optical pH detecting system could effectively monitor the change of the process pH. To test the applicability and stability of non-invasive optical pH detection system on the change in pH during the P. pastoris culture, which would spontaneously decrease the broth pH to lower than 4.0, it was conducted by adding NH4OH solution as a neutralizing agent to maintain the pH at 5.5. Similar to the process in E. coli culture, a difference was also observed between on-line and off-line measurements also occurred, while it showed a little dependence on the fermentation process. Figure 5 shows that the 5-l bioreactor resulted in the best growth performance followed by the micro-bioreactor and lastly the shake flask. The DCWs were 4.27 ± 0.12, 3.71 ± 0.12, and 2.21 ± 0.18 g/l, respectively, after 12-h culture. This result could be contributed to the capacity of pH to control as well as other factors such as the mixing of nutrition and the efficiency of oxygen transfer with different culture facilities of 5-l bioreactor, micro-bioreactor and l shake flask. It seemed that the capacity of pH to control in micro-bioreactor might be weaker than 5-l bioreactor due to its less buffering ability with a small working volume. However, it should be pointed out that as compared to shake flask, micro-bioreactor could effectively compensate the disadvantage of uncontrolled pH, and subsequently reflected into a change in the cellular physiology and metabolism. Lactic acid bacteria which always need a small amount of oxygen for their cell growth and metabolism are defined as facultative anaerobic microorganisms. Thus, regular DO parameter detected by DO probe loses the role to represent cellular oxygen metabolism. Moreover, additional neutralizing agent needs to be added into the broth to maintain a suitable range of pH for the cell growth and metabolism, as lactic acid is the main product of glucose metabolism. In this experiment, apart from controlling the process pH at 6.0, an additional process mass spectrum was introduced for L. paracasei culture as described in 5- and 50-l bioreactors (Lu et al. 2016; Wang et al. 2010, 2016), in order to calculate on-line physiological parameters of OUR, CER, and respiratory quotient (RQ). As shown in Fig. 6a, the DO dropped to zero at 2 h and continued until the end. Correspondingly, with a decrease in DO, OUR increased quickly and reached its maximum value of approximately 0.76 mmol/l/h when DO was zero. In contrast, the trend of CER and RQ was similar. CER increased quickly during the rapid cell growth phase, while it began to decline once the cells entered into the late cell growth and stationary phases (Fig. 6a, b). All these results were consistent with the observations as reported earlier using 5-l bioreactor (Tian et al. 2016), indicating that the micro-bioreactor could perfectly scale down the bioprocess of L. paracasei culture. Furthermore, through a comparison on the performances of fermentation in the micro-bioreactor and 250-ml shake flask, it could be found that the former was obviously superior to the latter in terms of cell growth, glucose consumption as well as lactic acid production (Fig. 6b). The maximum biomass in the micro-bioreactor (6.1 g/l) was 1.7 times as compared to using a shake flask (3.6 g/l). Besides, the rate of glucose consumption and the productivity of lactic acid enhanced by 42.1 and 38.6%, respectively. On one side, these results could be considered as the effect of eliminating low pH inhibition in the micro-bioreactor (Venkatesh 1997), whereas on the other side, it could be due to better mixing and mass transfer in the micro-bioreactor (Bridle et al. 2008). More importantly, unlike a simple input–output model in a shake flask, some of the key process parameters could be monitored on-line and in real-time in a micro-bioreactor to further understand the cell physiological and metabolic changes. Overall, by comparing with a shake flask, the micro-bioreactor not only demonstrated the advantages on the applicability of subjecting to different culture conditions, but also could characterize the real cell metabolic status by introducing more physiological parameters. Previous screening model as established by Lv et al. (2016) with some modifications was used in this study (Fig. 2). After ARTP treatment, a total of 2500 aliquot mutagenic mixtures were collected for preliminary screening, and 184 wells in the microplates exhibited yellow broth after culturing for 12 h. By comparing the cell growth and product formation with the parent strain, 24 wells presented higher OD (Fig. 7a), whereas 21 wells presented higher concentration of organic acid (Fig. 7b). Among these 21 wells, number 58 and 103 showed 46.5 and 41.9% higher organic acid titers than the parent strain. Subsequently, the diluted broth of number 58 and 103 were spread on the solid plates with bromcresol green, and 59 single colonies with relatively a higher ratio of clear zone diameter/colony diameter were selected. Every single colony was synchronously cultured in micro-bioreactors and shake flasks. After culturing for 24 h, it was found that four mutants of L. paracasei designated S1 to S4 in the micro-bioreactor significantly increased the production of l-lactic acid (an improvement of more than 15%), as compared with the parent strain (Fig. 8a). In contrast, besides the above four mutants, other two mutants i.e., L. paracasei S5 and S6 were selected due to their performances in the production of l-lactic acid (an improvement of more than 15%) in the shake flask rescreening process (Fig. 8b). Consequently, all the 6 mutants (L. paracasei S1 to S6) were cultured in the 5-l bioreactor for 24 h to test and verify their fermentation performances (Table 1). As expected, L. paracasei S1 to S4 exhibited an enhancement in the production of l-lactic acid to some extent, and L. paracasei S4 displayed the highest titer enhancement of 18.9% as well as an increase in the yield of l-lactic acid from 0.903 ± 0.005 to 0.932 ± 0.013 g/g, which might be due to an improvement in the biomass (Fig. 9), as the synthesis of lactic acid was closely dependent on the cell growth. However, it should be noted that although the concentration of l-lactic acid by L. paracasei S3 only increased by 13.6%, its biomass was almost the same as that of control (Fig. 9), indicating that L. paracasei S3 presented better specific productivity on the biomass, which was generally considered as an important index to evaluate the performance of strain. In contrast, the l-lactic acid titer of L. paracasei S6 was comparable to the parent strain, and L. paracasei S5 even demonstrated a little lower titer value. It could be concluded that with regard to screening flux, the micro-bioreactor was comparable to shake flask in rescreening process, whereas the micro-bioreactor demonstrated absolute superiority in terms of scaling up the cultivating system. This could be ascribed to maintaining a constant pH in the micro-bioreactor, which could eliminate the adverse effects of low pH on the cell growth and lactic acid production in the shake flask. On the other hand, in contrast to the shake flask, micro-bioreactor was more suitable for scaling up the bioprocess to 5-L bioreactor irrespective of its geometric form, or flow field characteristics. Moreover, it could be noted that through comparing the process physiological parameters between micro-bioreactor and 5-l bioreactor, the factors that limited in the process regulation or scale-up could be further inferred. Considering the optimized detection conditions of non-invasive optical pH and DO biosensors, the micro-bioreactor fully satisfied the requirements for the cultures of commonly used laboratory microorganisms with monitoring and regulating the process pH and DO. Additionally, in the rescreening process, 8-parallel micro-bioreactor system was introduced into high-throughput screening of high l-lactic acid production strain to substitute the traditional shake flasks. The results demonstrated that the micro-bioreactor presented comparable screening flux with shake flask, while it could significantly increase the scale-up possibility. Finally, a mutant of L. paracasei S4 was acquired which improved the l-lactic acid titer value by 18.9% as compared with the parent strain and enhanced the l-lactic acid yield to 0.932 ± 0.013 g/g. Overall, the outcomes from this investigation could be extended to other bacteria or yeasts in obtaining a high-performance strain by high-throughput screening strategy. XT, WW, and ZG conducted the experiments and data analysis. XT wrote the manuscript. MZ provided technical support for 8-parallel bioreactor system. HH, CJ, YZ, SZ gave advices in the experiment design and data analysis. AM participated in manuscript writing and polished the English thoroughly. All authors read and approved the final manuscript. This work was financially supported by the National Science Foundation for Young Scientists of China (31700038), the National Key Research and Development Program (2017YFB0309302) and the National Major Scientific Technological Special Project (2012YQ15008706). The datasets supporting the conclusions of this article were included in the main manuscript. This study did not contain any studies with human participants or animals performed by any of the authors.